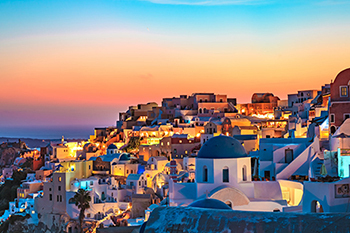 World-famous Thira (Santorini) is the southernmost In the Cyclades island complex. 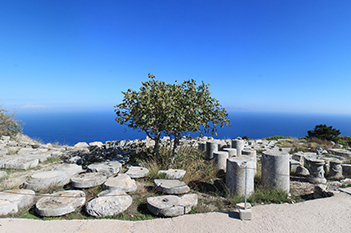 Bright and sunny weather, magnificent setting, quality accommodations, delicious local cuisine, exquisite wine, exciting entertainment and a rich history dating back to the Bronze Age, are some of the island's traits beguiling thousands of visitors each year. Thira has 14 villages, each with its own character, all of them creating an atmosphere unique to the island; Santorini - Fira, the island's cosmopolitan capital full of motion and night life, Pyrgos, with its castle, Oia, well known for its traditional 1| architecture and breathtaking sunsets. To the east, terraced fields sloped gently towards the sea; uphill, to the west, lays the rim of the crater. 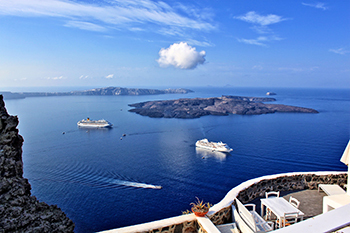 Unlike other Greek islands, Santorini - Thira is formed by the crescent-shaped tip of a volcano that blew its top in one of history's greatest cataclysms sometime during the Bronze Age. Two uninhabited islands, Mikri Kameni and Nea Kameni, rise from the centre of the collapsed crater, the latter created by an eruption in the 18th century. When the eruption occurred in about 1500 BC. a civilization was wiped out and an entire city was buried under a layer of ash and pumice. When that city was rediscovered in the i96o's, it proved to be almost perfectly preserved, thus giving archaeologists a fabulous window into life in ancient times. Thira's artists painted colourful frescoes of animals, sport and war; its women had a passion for jewellery and bright clothes; and its engineers constructed a remarkable system of running water piped into each dwelling. 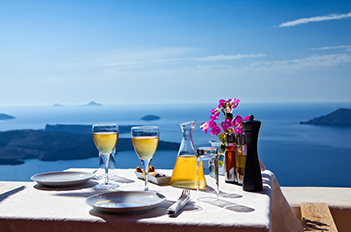 Santorini is home to several original wine genres, with the production of wine dating back to the Bronze Age, The devastating volcanic explosion covered the island with volcanic ash. lava and pumice stone, creating the foundation for perfect soil conditions that now produce very distinctive and tasty wines. Life Is beautiful on Greece's most poetic island. After all, Lawrence Durrell wrote: "sunset and sunrise here put poets out of work".